All loading bay pavilions have space available for vehicle ramp. We also have pavilions with dock leveller 3000mm long, which only disadvantage is larger dissipation of heat. 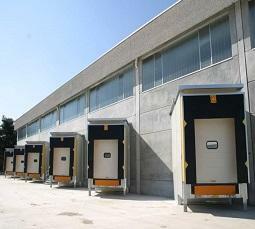 Loading bay pavilions can be installed next to completed buildings at the end of all loading operations. Not including loading bay pavilions area in the total building area because they can be disassembled. Using loading bays pavilions as pre-chamber especially during loading of “deep frozen” goods by addition of insulated sectional door in the pavilion door opening. 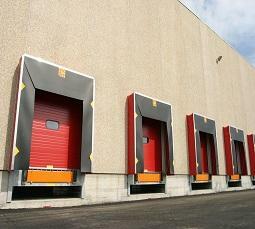 Use of 40mm insulation which will be closed during loading process and will open automatically during fork lift passage. Modular loading bay pavilion equipped with dock leveller and dock shelter is a solution satisfying needs of many customers. Pavilion is constructed outside the door opening and thanks to sealing the connection between truck and the building it prevents heat dissipation, access of pollution, rain, dust or air streams disturbing the operators. Entire structure is rust protected by galvanisation. Standard model is equipped with two front feet of adjustable height (from 800 to 1300mm). Side walls made of insulated panels 80mm thick or simple not insulated sheets with steel layer. Insulation under dock leveller 550 mm from dock level made of insulated panels 40 or 80 mm thick. Rear supports made of adjustable height feet. Inflatable cushion seals – designed especially for “cold goods” at inside warehouse temperature in the range from -45 to -15°C; they can be adjusted to various height of vehicles ensuring maximum insulation, by connecting the warehouse with the vehicle the inflated cushions prevent heat dissipation, access of water, dust and undesirable air streams. Cushion seals – designed especially for “cold goods” at inside warehouse temperature in the range from -45 to -15°C; the horizontal upper cushion can be fixed or adjustable, decreasing dock opening by 15-20 cm. No need to perform maintenance works underneath dock leveller because power supply to the door and leveller is located in the console attached at the eye sight level in easily accessible place. 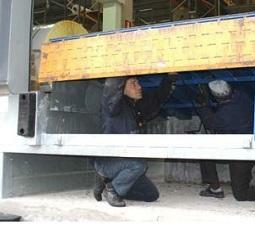 Risk of accidents is reduced because there is no need to perform maintenance works underneath dock leveller. No springs which were replaced by hydraulic FIDELITY drive. Maximal reliability – 5 year or 500 000 cycles guarantied providing that the annual inspections are regularly made. Routine inspections reduced to simply checking oil level inside the wall console and visual inspection of all parts. Equipped with protection eliminating door damages. No need to perform adjustments. Centralised hydraulic system ensures reliable operation. More aesthetic than spring systems. In case of failure each console is equipped with manual pump for door opening; due to the gravitation closing of door only requires opening of one valve, therefore with the aid of appropriate drill the door and dock leveller can operate without power. Dock levellers CAMPICAST are delivered with preassembled electrohydraulic powering system underneath the leveller. It was designed for direct installation in concrete without the need to construct special loading station; it is sufficient to prepare the edge and slab on which leveller will be placed. After placing leveller on the slab and securing it in position to prevent movement during pouring of concrete, concrete is poured and pavement is constructed. Levellers are covered with non-slip surface and equipped with machine weld supports. Dock levellers CAMPIC are delivered with preassembled electro-hydraulic powering system underneath the leveller or with multifunctional Consolle function. It was designed to fit standard loading bay or CAMPISE readymade systems: readymade station, readymade dock or readymade loading dock pavilion. Structure of this dock leveller is compliant with standard EN 1398. According to the standard EN 1398 dock leveller adjusts to the inclination of vehicle up to 3% of its width – the maximum inclination allowed by standard EN 1398 equals to 12,5% however vehicles slide at this inclination. The largest inclination which transport means can conquer is 8% for forklifts and 4% for pallet jacks. Rubber bumpers of SUPER type which constitute a part of readymade equipment – however bumpers need to be ordered for traditional docks for installation on plates by means of wall plugs. CASTLE type electrohydraulic dock leveller with swivelling or telescopic lip was designed to be installed at traditional stations. It is delivered with electrohydraulic powering system to be installed underneath the dock leveller or with multifunctional console. 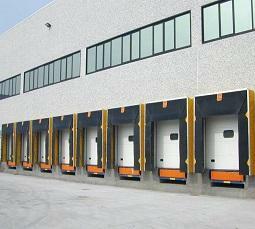 Structure of the dock leveller is compliant with standard EN 1398.